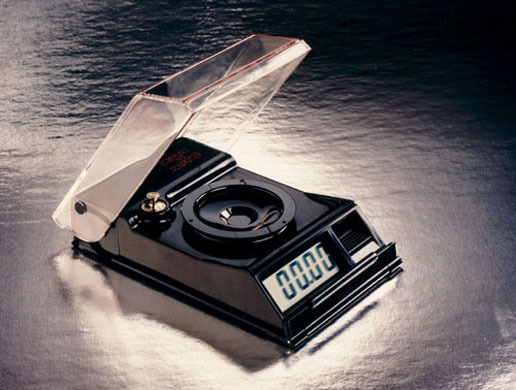 The Dendritics Gemscale 50 set the standard for all portable carat scales. It is still the best selling carat scale. The original Gemscale. Portable. 5"X 3"X 1" and 200 operating hours on one 9V battery, included. You can take it and weigh anywhere. Gemscale 50 weighs up to 50 carats by .01 precision. Easy to use. One button operation. One year warranty. Made in the USA. The research and development which has gone into Gemscale 50 since its conception is responsible for its success as a portable carat scale, where others have failed. Gemscale 50's size, weight and accuracy make it ideally suited for its purpose. Gemscale 50's market is the gemstone and diamond trade. The jewelry industry is dependent on gem and diamond dealers for these precious commodities. Diamonds and colored gems are shown, sold and delivered by dealers who can be on the road for up to six months a year. Gemscale 50 was designed for travel. An accurate, dependable scale is vital to the trade. Even on the road, gemstones need to be weighed for pricing and identification. The self-tests engineered into Gemscale 50 during the calibration turn-on help prevent corrupted readings. This self testing helps eliminate costly mistakes. A portable carat scale also has to be durable to perform after the rigors of traveling and handling. The durable compact ceramic sensor makes this technology ideal for travel. Security is also important for the traveling dealer. Security is greatly improved by the compact size of Gemscale 50 which allows the scale to be concealed in a pocket as easily as packets of stones. The Gemscale 50 product was discontinued (in a manufacturing sense) in February 2000. It was replaced by the Gemscales 55 and 125. It was our best-selling gemscale ever.